Our company is a leader in assembly services. Our specialty is desk assembly. We have a team of experts who run numerous errands within London every day. If you ask us for help, we will come to you as soon as possible and assemble all your desks. We offer residential and commercial services. Our desk assembly service is designed for a number of desk types and styles. Desk assembly can be done by oneself but you had better use our help after all. The process includes a few steps. When our technicians visit a client, they carry with them their own tools to help them assemble desks. They begin by attaching the two sides to the back of the desk to provide a good basis for the other parts. All the cams are put into the holes and then screwed with a screwdriver. Our desk assembley service is only one of the professional handyman services offered by HomeMates in London and Greater London. Next, our workers put all the drawer pieces together and glue them. They may use a clamp to hold the drawer together until all the pieces are set. Our specialists proceed to installing the other parts of the desk. The file cabinet drawer pedestal comes next. They place all cam locks into their holes and then screw and lock them with a screwdriver. The hanging file rack is placed in one of the drawers. As for the desk drawers, our experts need to screw the knobs tightly, then after screwing the hinges to the door, they line them up with a screwdriver. When they are done, our workers tend to clean all the mess they left. And then they are off to their next project. We work with precision and care. You can book a service any day and any time of the week. Get more details about our company by giving us a call. You can also send an online enquiry. 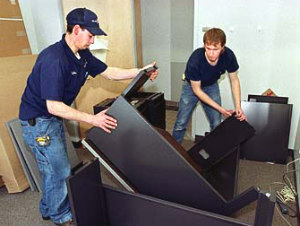 Just make sure you let us know ahead of time that you want help with assembling of your desks.